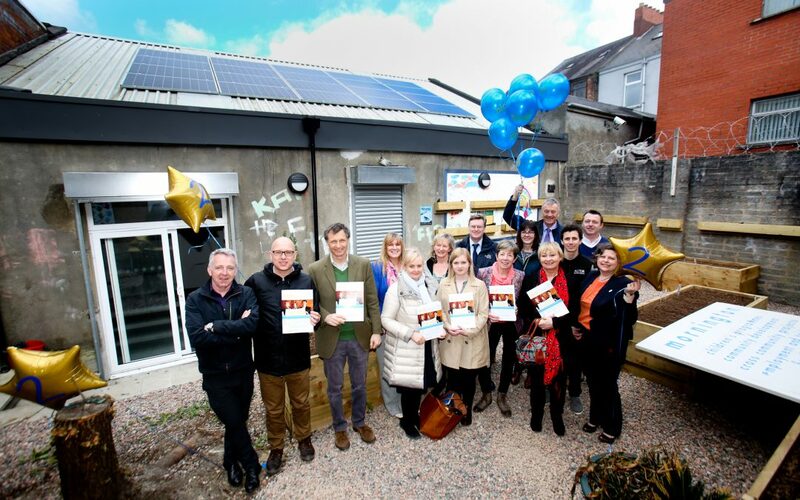 There is an increasing recognition that community energy has the potential to create significant social, economic and environmental opportunties for communities in Northern Ireland. The emphasis of community energy projects is on local engagement, leadership and control, project outcomes which benefit local communities, and making a valuable contribution to creating vibrant communities. The video below is an inspirational short film highlighting case studies of social enterprises working in renewable energy, in Finland and Northern Ireland. The Northern Irish cases are Upperlands Community Development Ltd., Drumlin Wind Energy Co-operative and Cloughmills Community Action Team. The NICE project was set up to encourage community ownership of renewable energy technologies, specifical solar PV, and take advantage of financial incentives offered by government for renewable electricity (Renewable Obligation Certificates). The net benefit for the community is reduced reliance on electricity derived from fossil fuels, helping to reduce carbon emissions, provide energy savings, and build community resilience and strengthen the local economy. NICE offered solar pv array installations, free of charge, to Northern Ireland 3rd sector organisations. Participating organisations and community groups entered a ‘share your roof’ agreement with NICE who handled all of the arrangment matters and associated costs. The PV systems set up under the scheme are owned and maintained by NICE for a period of 20 years (20 year rent-free lease of the panels, after which the ownership of the solar installation outright passes to the building owner). The ROCS generation and electricity export tariffs return to NICE, repaying the interest on shares and any capital loans, covering overheads and contributing to a community fund for future renewable energy initiatives and energy efficiency services. Once installed, the electricity generated by the solar panels was made available for use in that community building at a considerably reduced rate compared with the cost of the equivalent electricity taken from the National Grid. Participating community organisations became a member of the NICE Co-Operative and a co-owner of the enterprise, involved in its running and decision making processes. The advantage of the project was that the money stayed in Northern Ireland and benefits the local community. Investment opportunities were made available and funding for future projects generated. NICE funded & commissioned the completion of solar pv installations for 13 N.I. community groups the total capacity of which is 130 kW. Installations range from 4 kW to 15 kW. Below is a map of the installations installed free-of-charge under NICE. Mediation Northern Ireland, at 83 University Street, Belfast BT7 1HP. Solar pv panels were installed on Mediation NI’s roof in February 2015. This is a 4kW array. Chinese Welfare Association, at Stranmillis Embankment, Belfast BT7 1GB. A 12kW solar pv array was installed and went live at Chinese Welfare Association 21st May 2015. Ashton Centre, at 5 Churchill Street, North Belfast, BT15 2BP. Another 12kW solar pv array was installed and went live 2nd week June 2015. Whitehead Community Association, at 20 Balmoral Avenue, Whitehead BT38 9QD. A 15kW solar pv array was installed and went live June 2015. Rath Mor Centre, Creggan Enterprises, at Bligh’s Lane, Derry/Londonderry, BT48 0LZ. Another installation 12kW solar pv array was installed and went live June 2015. YMCA Londonderry Branch, at 51 Glenshane Road, Londonderry BT47 3SF. An installation of 12kW solar pv array installed and went live July 2015. Women’s Aid, Belfast & Lisburn, at 30 Adelaide Park, Belfast, Co Antrim BT9 6FY. A 12kW solar array was installed and commissioned last week of July 2015. Niamh Mental Wellbeing, Aspen Beacon Centre, at 16 Finaghy Road South, Belfast, BT10 0DR. A 4kW solar pv array installed and went live beginning of August 2015. Bryson Recycling, at Belfast Road, Central Park, Mallusk, BT36 4FS. A 12kW solar pv array was installed and commissioned mid August 2015. Ulster Wildlife, 10 Heron Road, Belfast, County Down BT3 9LE. A 12 kW solar pv array installed late August 2015. Harmony Community Trust, Glebe House, at 23 Bishopscourt Road, Kilclief, Strangford, Co. Down. BT30 7NZ. A 6.5 kW solar pv array installed late August 2015. Confederation of Community Groups, at Ballybot House, 28 Cornmarket, Newry, Co. Down BT35 8BG. A 12kW solar pv array installed first week September. Mornington Community Project, at 117 Ormeau Road, Belfast, BT7. A 4 -5 kW array installed early September 2015. NICE Phase 2 was launched on 25th April 2016 and has raised just over £61k. This enables NICE to add 5 x 12 kW PV arrays to its portfolio. The addition of this 60 kW will take NICE to a total of 190 kW. TIDAL, Toomebridge Industrial Development Amenities and Leisure Limited, Toome House, 55 Main Street, Toome, Co. Antrim, BT41 3TF. Installation completed 1st September 2016. The Nerve Centre, 7-8 Magazine Street, Derry, BT48 6HJ. Installation on order for completion & commissioning by 15/09/16.